In reality, winter weddings are rather trendy! Not only do they tend to be cheaper as many venues and vendors offer discounted Winter rates, but they offer an incredibly magical and romantic backdrop for photos - the ice and snow shimmers and sparkles in the winter sun and reflects beautifully on the couple. Now, to actually enjoy a winter wonderland wedding, you have to be well prepared, and what better way to stay warm then in Ugg boots, a white faux fur coat, and Apple Cider? Alana and Dan’s winter wedding at Ancaster Mill had all that, and much more! 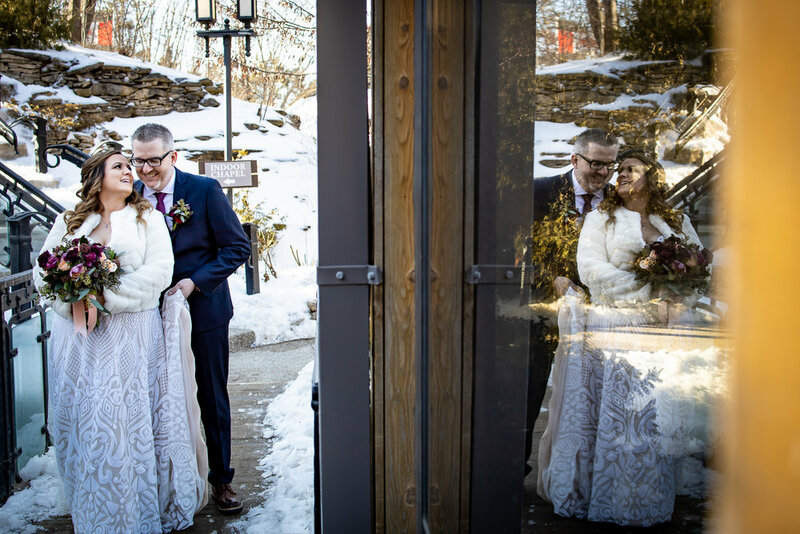 Their winter wedding at Ancaster Mill was our first wedding of the year. While the ground was icy and covered in snow, the day was bright, sunny, and beautiful - the perfect combination to make the snow and ice shimmer. Alana got ready at her parents’ family home with her family and friends. Everyone was relaxing and enjoying some quiet time with hot cops of coffee as Alana was getting ready. 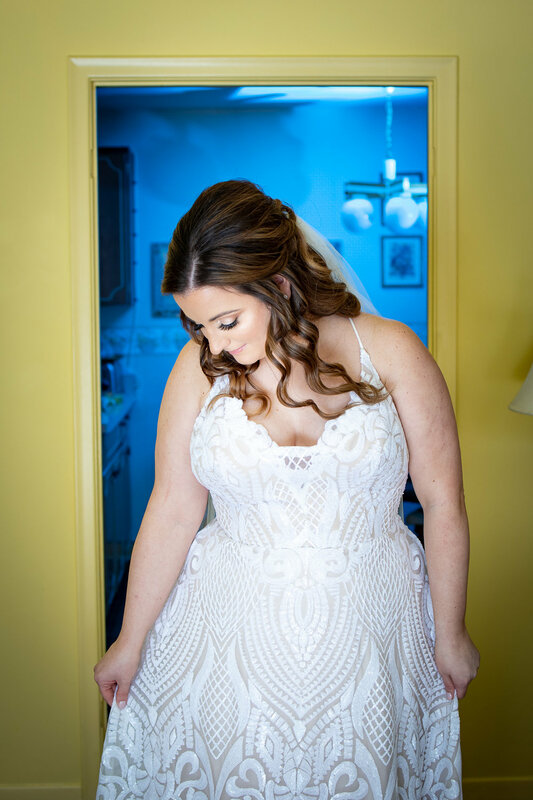 Once Fancy Face finished Alana’s make-up and she put on her JLM Couture dress, her look came together and she looked fierce and ready to pose for her bridal portraits! Dan got ready at his parents’ home as well with his son and two of his closest buddies by his side. Before getting dressed, all the boys headed down to the basement for a couple of quick games of pool, which were occasionally interrupted by the sweetest attention-seeking cat. After a few rounds of pool, the boys went upstairs to get their clothes to start getting dressed. 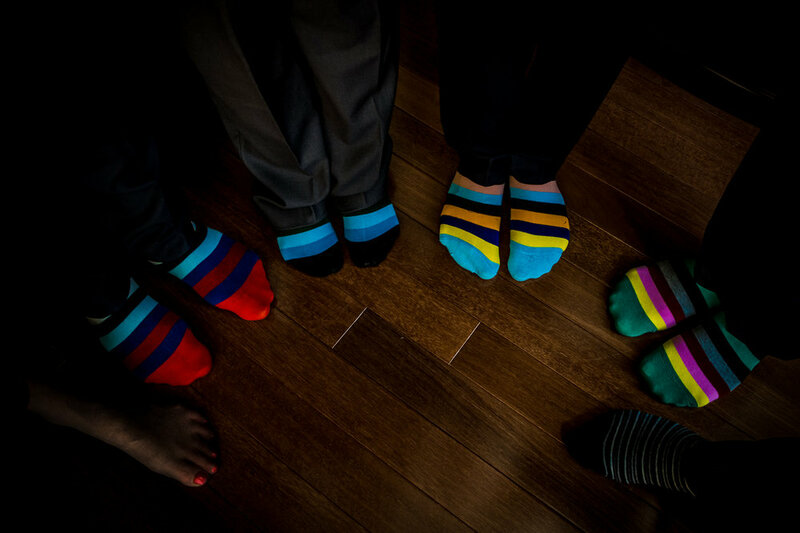 They all emerged proudly wearing just their shirts, underwear, and bright and colourful socks, which they got a kick from showing off (and of course mom and dad had to get in on the action as well). After a few attempts to get everyone’s ties in order, and dad having to step in and give a helping hand, they were all set and ready to go. Dan and Alana had an intimate first look in front of the waterfall at Ancaster Mill. Wearing her warm Ugg boots and a gorgeous faux-fur coat to keep her warm, with her cheeks flushed pink from the cold, Alana looked absolutely radiant, and it was clear that Dan thought the same when he turned around and saw his soon-to-be wife in front of him. After a few moments where Dan and Alana shared some giggles and caught up on their morning getting ready, we walked around the stunning property of Ancaster Mill for their couple portraits, taking advantage of all the architecture and snowy gardens. As we were finishing the portraits in front of the chapel, guests were already starting to arrive for the ceremony. While Alana scurried off to be out of sight, Dan made his way to the chapel to great guests with a cup of hot apple cider. The Miller's Chapel at the top of the Ancaster Mill property is bright, spacious, and elegant, with a gorgeous fireplace at the front of the altar and amazing balcony views, framed by arched wooden beams. The Miller’s Chapel is a perfect mix of old meets modern, and the perfect place to capture Alana and Dan say their I do’s in front of their closest family and friends. Following the ceremony, the guests made their way to the Solarium in the main building to enjoy cocktails, hors d’oevre, and stunning views of the waterfall and the stream below. In the meantime, Alana and Dan, along with their family and bridal party, bravely came out into the cold for their formal bridal party and family portraits on the private covered terrace adjoining their reception space in the 1812 Room, which is the original mill and the most historic room at Ancaster Mill. We had to be super efficient while organizing everyone and capturing the photos to ensure no one stayed out in the cold for too long and could get back inside to enjoy some more cocktails and appetizers before the reception started. After a phenomenal dinner (did you know there is a restaurant at Ancaster Mill?? Highly recommend for a romantic date night!) and heartfelt speeches, the dance floor opened and everyone joined in. The absolutely highlight of the party was a father-son duet of Bohemian Rhapsody sung by Dan and his son. The bond and love shared between the two was clear as the young boy wiped away his tears. By the end of the song, we were also wiping away our tears behind the camera, but were reminded by the mother of the bride that it’s ok and no need to hide. The whole day was just so sweet and beautiful that by the end of the night Diego and I were the biggest mush balls. Dan and Alana, thank you so much for having us capture your beautiful day with your friends and family. It was absolutely lovely!